I subscribe to Daily Mix, which is a Youtube Channel based in England. And one day (this was around the time that my family and I decided to go to Europe) I was on Youtube and the channel had posted a new video. I watched the lengthy video and quickly jotted some places that they had mentioned in the video. I had mapped out tons of places to snack about if we did accidentally pass by. 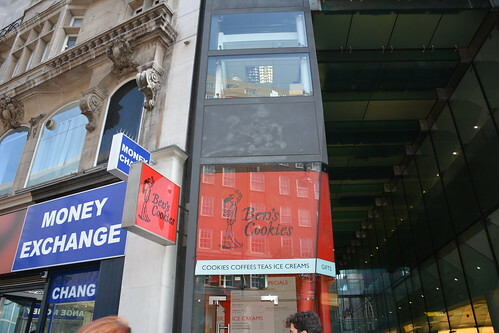 We actually didn’t see Ben’s Cookie’s until I had noticed it on the opposite side of the street we were shopping on. And that day, I had told D that we didn’t need to stop by if it wasn’t on the way (to the locations that we needed to visit). So we picked up four cookies and three free ones (apparently they have a special or something) and D had a sorbet. There were many selections to choose from. 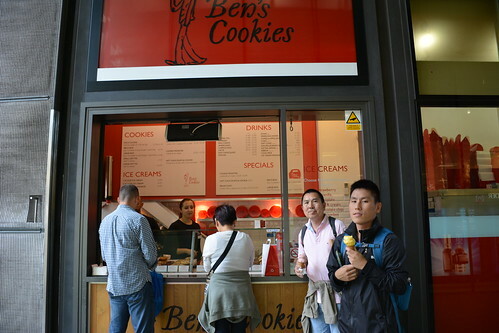 I got the peanut butter cookie, that had lots of peanut butter chunks. The cookies are quite large, so do expect a big treat. P.S. Have you read my previous foodie posts? Click here, here, here and here to get caught up.